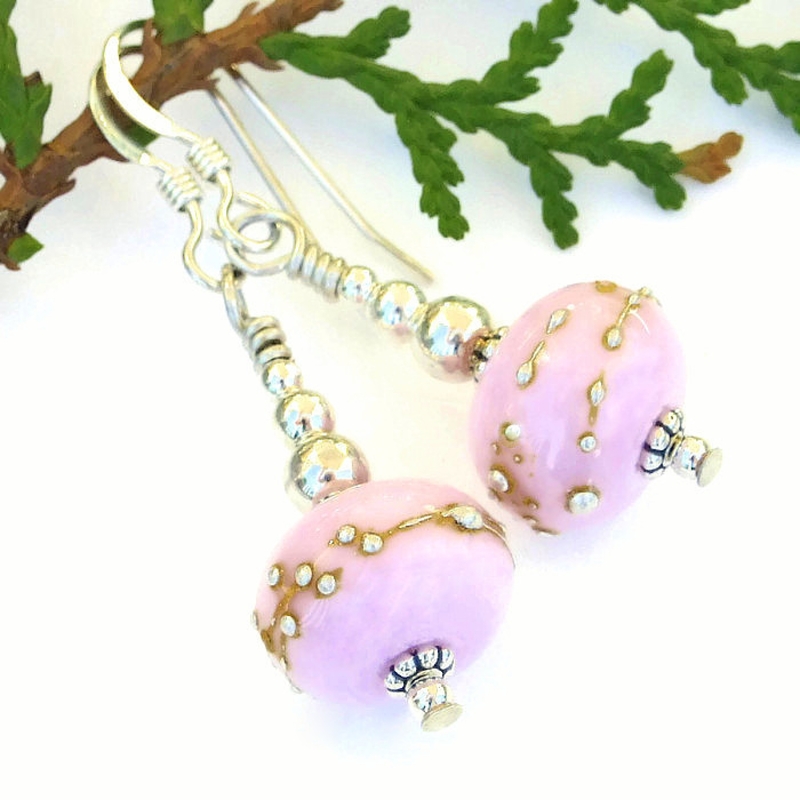 Your ears will receive a glorious jolt of color when you wear these eye catching bubblegum pink lampwork glass and sterling silver dangle earrings, named PINK AND PERFECT. 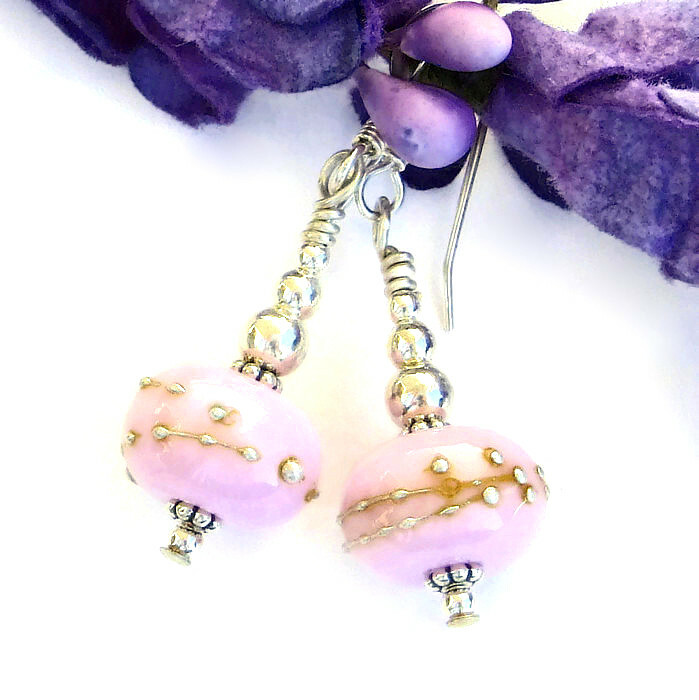 The handmade earrings feature lampwork beads that were individually artisan created by Charlotte of Covergirlbeads in a fun bubblegum pink color. To add interest, texture and glow, the unique beads were wrapped in fine silver, causing raised dots of silver to appear along the equator of the beads. Sterling silver daisy spacers cap the top and bottom of the beads. 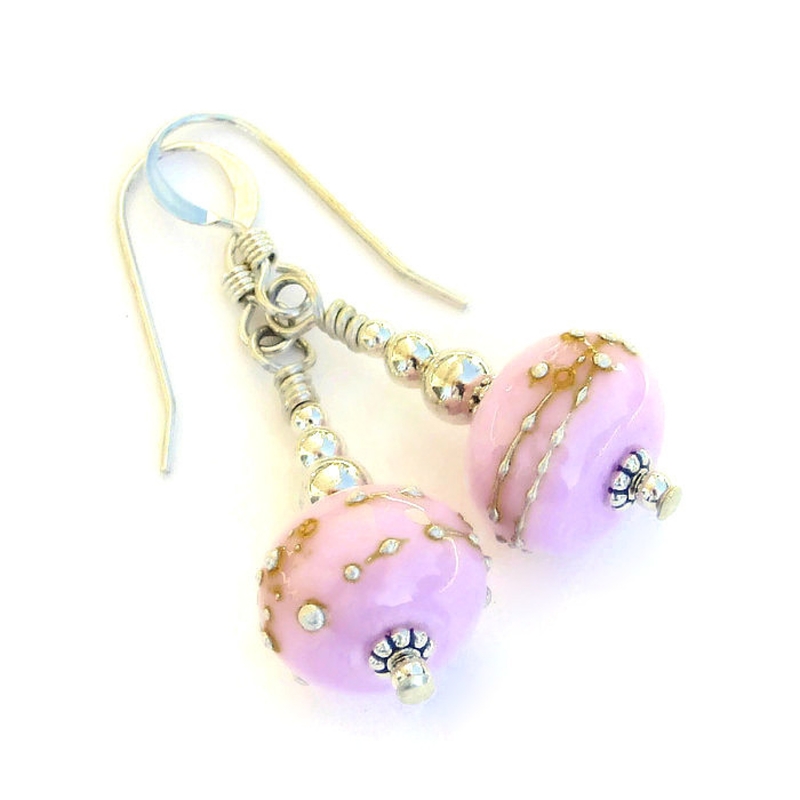 To add more than a large dose of silver sheen to enhance the look of the fine silver dots, three different sizes of sterling silver beads were stacked on top of the pink lampwork beads: 4 mm, 3 mm and 2 mm. All the components used to create the earrings were carefully wire wrapped on sterling silver headpins and connected to sterling silver French hook earwires. The earrings are ideal to wear with your faded jeans and white shirt or with your favorite dress up frock. 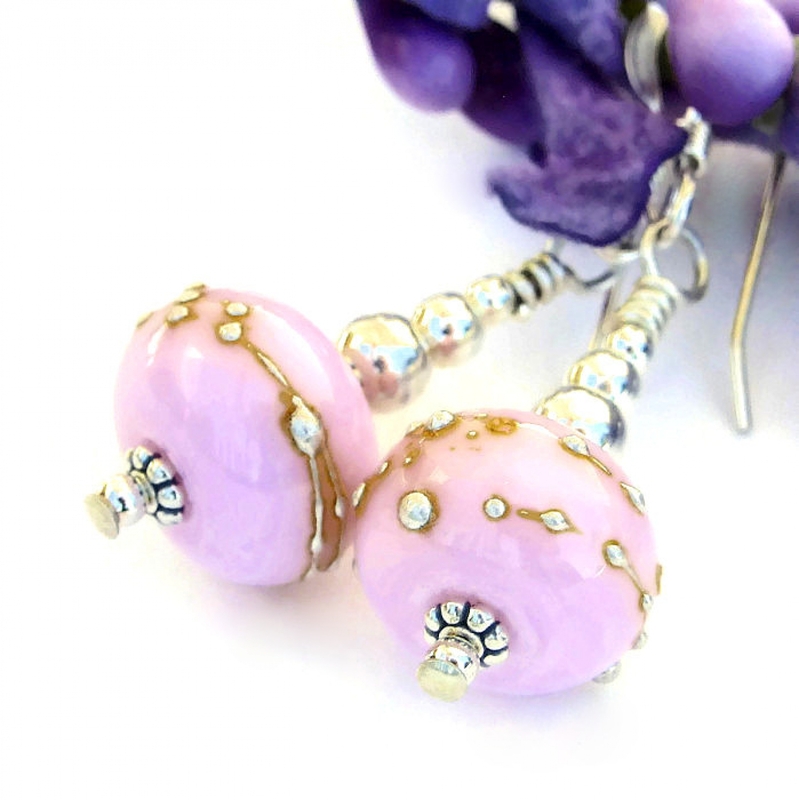 The one of a kind PINK AND PERFECT earrings, a great Valentine's Day gift, were carefully designed and handmade by Catherine of Shadow Dog Designs for the woman who adores wearing one of a kind jewelry that is not mass produced. 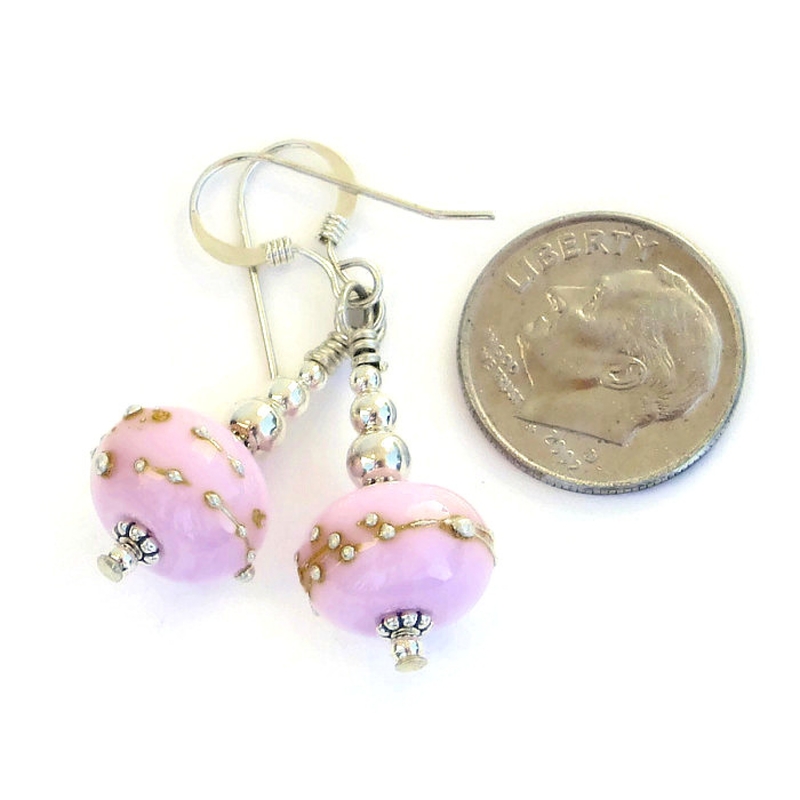 For a better understanding of the relative size of the PINK AND PERFECT handmade lampwork and silver earrings, please be sure to check out photo #5 for a size comparison with a dime. Although man made, glass is said to carry the energies of transformation, rebirth and communication. Silver is a metal of love and healing; it is a mirror to the soul, helping us to see ourselves as others see us. 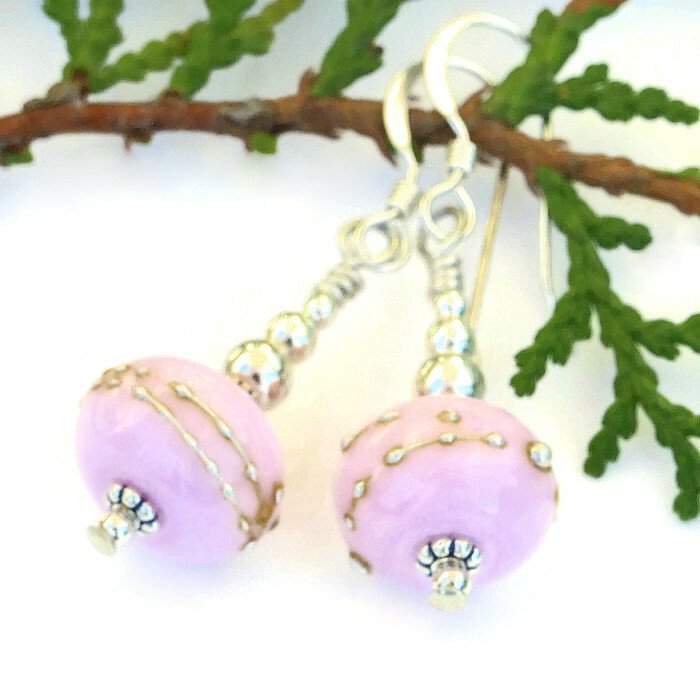 The PINK AND PERFECT artisan earrings were carefully designed and handmade in a dog friendly, smoke free studio. They will be carefully packed in an organza jewelry bag with tissue, perfect for gift giving to a loved one . . . or to yourself!